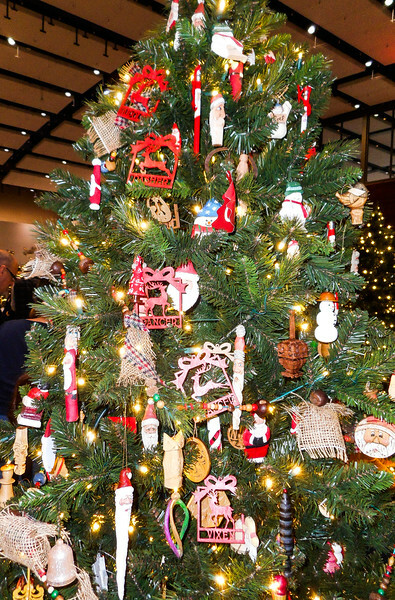 Festival of Trees is in its 33rd year and has raised over $7.4 million to support the Blank Children’s Hospital family support programs. These programs were established to serve the unique needs of children. The Club has participated in this Community Service Activity for many years. Carver Member Mary Voss led this joint project Of the Turners, Carvers and Woodworker Clubs for 2016. All the ornaments were made and donated by the Members of these three Clubs. The Decoration Crew was Terry and Mary Voss, Patty Hemphill, Bob and Ginny Wheeler. Festival of Trees & Lights 2016.